The Dodgers enshrined Vin Scully in the Ring of Honor at 7:06 pm on Wednesday May 4, 2017. Vin Scully was at Dodger Stadium for the unveiling of his plaque. When the Dodgers handed Vin the microphone, the loud stadium quieted down to hear him speak. Tommy Lasorda and Sandy Koufax were present for the very special day and they were the ones to remove the cover from the Vin Scully plaque. Dave Roberts stood next to Vin and the whole Dodgers team stood behind him. For just a little while, it didn’t matter if a fan was wearing Dodger Blue or Giant Orange, everybody was a fan of Vin Scully. “For one last time, and if you want to join me, that’s great. 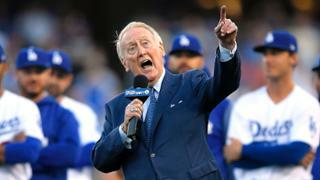 ‘Hi everybody and a very pleasant good evening to you.’ This is a rather emotional moment for me but I’m trying very hard to keep a stiff upper lip,” Vin addressed the crowd. He then went on to tell a story about the first time he heard the name Tommy Lasorda. Of course, he could tell it so much better than I could, so you can enjoy it and watch the video of the entire ceremony below. From where I sat in the left field pavilion, I had a great view of everything going on. On all sides of me, there were Giants fans and Dodgers fans, we were all looking to our right as we say Tommy Lasorda and Sandy Koufax unveil Vin’s microphone. When we looked in front of us, we could see the field and Vin Scully surrounded by cameras. To our left we could see Diamond Vision, and get a close up view of what was going on.